Several immutable Gold Rules appear to be self-evident and powerfully manifested in the modern world of banker corruption, financial market intervention, currency debasement, phony accounting, and economic deterioration, all amidst powerful incessant media propaganda, against a backdrop of endless war. The global fascism movement has taken deepest root in what during the 1960 through 1980 decade was the capitalism regions steeped in democracy. Since the Lehman Brother scuttle and the Fannie Mae adoption and the AIG black hole admission, the financial crisis that began with the housing bubble and subprime mortgage bust has turned virulent. The global financial crisis is better described as a global monetary war to defend the toxic USDollar, whose sunset can be seen. In the last 12 to 18 months, the monetary war has again morphed, this time into a far more serious and financially violent global Gold War. Nations are fast realizing that their only true liquid assets of value are their gold reserves, and even they have been tampered with or stolen in a vast re-hypothecation scheme. The Gold War is on, having moved to a higher gear, but nowhere near a climax gear. The true value of gold is being realized. The strength of gold during insolvency crisis is being observed. The resistance and rescue from the plague of insolvency is being made clear on a global stage. The new important part of the Gold War comes with the Allocated Gold Account scandal which will dwarf the LIBOR and MFGlobal scandals. The demands for repatriated gold accounts, primarily from the criminal bank sectors in London and New York, have amplified. Germany has finally joined with demands for gold repatriation. The demands will continue to grow even as tampered gold bars add to the motivation to repatriate. If only Chavez of Venezuela knew that he was to start a global trend to call gold home, in a Gran Aletazo de Mariposas. The grand butterfly flapping has caused a whirlwind that will turn into a tornado to wreck the central banks in a final death blow. The law can be stated: The Gold Standard will return from a sheer standpoint of value, stability, and resistance to storms based in failed bond auctions, debt writedowns, and insolvency consequences. Only a hard asset backed new currency can replace a fiat paper currency reserve. The law is self-evident and being manifested, with alarm if not deep trepidation by the financial leadership among the Western nations. While the central banks and the finance ministers stumble around seeking solutions, applying patches, making money free, redeeming toxic bonds, and otherwise bumbling in the midst of their own balance sheet and fiscal ruin, the emergence of Gold has become clear. It is the only asset rising of recognized value during the grand debasement of money committed by the central banks. It is the only asset whose value is being demonstrated as strong during the fiscal cliffs that so many major industrial nations have already gone over. They are not approaching fiscal cliffs. Four consecutive years of USGovt deficits over $1.3 trillion amply demonstrate to anyone with an uncorrupted view and unaltered pulse that the crash into the canyon floor is next, not the plunge over the cliff. Downward acceleration and speed have already been achieved. As nations and continents come to realize their new debt compositions are nothing more than a series of shots of tequila for the patient suffering delirious tremens from alcohol poisoning, they are coming to the painful conclusion (for them) that a Gold Standard is the only solution. Applications of more paper mache accomplish nothing when the base of paper is rotten. The Gold Standard will be imposed upon them by the global rebellion against the USDollar, which will emanate from the trade sector. The Gold Standard will return, in the form of trade settlement as its payment core, as in the short-term trade notes. The bank cartel will be brought into the standard from which they broke away in 1971 with the abandoned Bretton Woods Accord. They will be brought in kicking and screaming, since only Gold can and will properly bring the nations out of the wilderness from the chaos. Once more, the banking systems will follow the trade system, rather than the corrupt banks dictating terms on reserves management in fiat paper currencies which disseminate toxic bonds. It has been backwards for 30 years. The law can be stated: The Gold Bull continues unbounded with the Zero Percent Interest Policy (ZIRP) as its primary cylinder, while the artificial 0% distorts all financial markets, all assets, and all value. The Gold Bull will continue until the USGovt debt default, and until the USDollar retirement. The 0% official rate has been declared as permanent, if the words of USFed Chairman Bernanke are properly interpreted. A sliding forward promise, first told as end 2013, later revised to end 2014, later to be end 2015, is a clear signal to those with an active brain stem. It is permanent. The 0% rate, however maintained like with Interest Rate Swap contracts, renders all financial markets as grossly distorted, since most assets have a value that extends from the cost of money. But practically, the USGovt debt cannot manage a rate hike, or else the borrowing costs approach the size of major social programs, even approach the size of the USMilitary offense budget. A rate hike would break the entire debt structure and result in a quick default and wreckage of the entire USTreasury Bond complex. Worse, a rate hike would cause a sudden collapse of the support structures bound within the vast derivative complex. This complex has enabled the US financial structure from a collapse that should have occurred around the 1998 to 2001 timeframe. Also, a rate hike would bring ruin to the big US banks heavily committed to the USTBond carry trade, for easy risk-free profits. Recall the Jackass forecast of a USGovt debt default, the position stated in the last months of 2008. The event is coming true. The Gold Bull is powered by the negative real rate of interest. Its calculation is made simple by the 0% official rate. But take the prevailing consumer price inflation rate of about 8% to 10%, subtract it from the rate earned, tied to long-term USTBonds. The result is a negative real rate at minus 6% or minus 7%, sufficient to power the Gold Bull Market. Given the permanent ZIRP policy, the Gold Bull is in permanent mode. All talk about the Gold Bull Market having run its course is based on vacant arguments and nonexistent logic. It is the propaganda of fools, even desperate people. Calls that the bull in gold has run its course since it hit the $1000 level were laughed at by the Jackass a few years ago. Calls from the same scummy deceptive corners that the bull in gold has run its course since it almost reached the $2000 level are also ridiculed. No solutions have been installed, and the grand debasement of money persists without end. Many doubters and critics of the Gold Bull Market will be humbled when it vaults past that level. The justification, numerous as they are, are gaining attention. The Jackass is glad to help the process along, and to silence the corrupt corners. The law can be stated: The bond monetization known as Quantitative Easing (QE) powers the upward move in the cost structure for the global economy. The result is a shrinking profit margins imposed on the entire economies, felt in job cuts and reduced budgets for expansion, even maintenance. The expanded bond monetization has been declared as permanent, if the words of USFed Chairman Bernanke are properly interpreted. A sequence of bond purchase commitments, including both USTBonds and Mortgage Bonds, to meet urgent calls to address the quagmire, is a clear signal to those with an active brain stem. It is permanent. In fact, the QE3 has some rather obvious motive to cover the multi-$trillion mortgage bond fraud, thus permitting a possible housing market recovery. Not gonna happen. The foreign bond creditors have vanished, with only a scattering of Japanese and Chinese investors serving as the bulk of foreign demand. In order to prevent the short-term USTBill yields from shooting up to 5% suddenly, in order to prevent the long-term USTBond yields from shooting up to 10% suddenly, the USFed has made a series of commitments to buy the USGovt debt. Nobody seems to want it, nobody seems to afford it (savings vanishing act), nobody seems to find it as holding value anymore. Besides, deep criminal banker fraud is becoming recognized in story after story. Without the vast QE, despite all its deception and chicanery like Operation Twist, and without the vast apparatus of interest rate derivatives to maintain the 0% artificial rate, the USTBond structure would collapse. If these words seems absurd, then the reader is probably ignorant, uneducated, or wearing red white & blue jockey shorts. The law can be stated, as a profound consequence: The combination of ZIRP & QE lead to capital destruction and systemic breakdown. Observe the fast falling Money Velocity while money supply grows at a staggering pace. The telltale signals are the capital destruction, the retirement of equipment, the shutdown of unprofitable businesses and business segments. The USEconomy is not in recovery, but rather in a grand deterioration process. The evidence is overwhelming, shown on a regular basis within the Hat Trick Letter reports. Whether reduced rail shipments, or fast rising Food Stamp participation, or significant declines in payroll tax withholdings, or still growing state budget deficits, or the stunning fall in Money Velocity, those among the aware crowd can see the pathogenesis. The principal cause is the Zero Percent Interest Rate matched by Quantitative Easing, which kill capital as they lift costs. This is the glaring shocking blind spot among hack US economists, most of whom are compromised by either Wall Street or university grants. Hardly any have my respect, since abject apologists for the failed system with few if any valued lucid perceptions. They are the corrupt harlots of Wall Street. They are the vapid academic talking heads. The path paved by fiat paper currency has led to insolvent systems. The current monetary policy coordinated by the major central banks of the United States, Europe, United Kingdom, Switzerland, and Japan assure no deviation from the path driven by momentum of the grand sovereign debt defaults and ultimate systemic breakdown. In fact, no solution is even attempted, a consistent Jackass point, since the policies and actions are directed toward preservation of power and away from big bank liquidation. The commitment to the failed system increases every year, assuring the impact of the systemic breakdown to be greater as well. The law can be stated: The anti-Gold system continues to attempt to reinforce itself until its final implosion. Criminal means and false accounting backed by media propaganda are their tools that reinforce the current power structure. It will yield to foreign designed trade settlement systems, to the forced Gold Standard return, and to vast liquidation. For the US and UK and Europe and Japan, the 0% official rate will continue until the debt defaults occur, which are in progress. The government deficits will not come down. They will instead escalate, as the economies produce fewer tax receipts and the calls for socialist relief programs expand. The political apparatus is being recognized as broken, a travesty in full view. The economies are experiencing a permanence in the shock from the ZIRP & QE in tandem. Households feel the higher cost of food, energy, utilities, town services, and even property taxes. Businesses feel the higher costs of everything from energy to materials to shipping. Lately they will react to the Obama Care as the health care tax is imposed, against their will. The financial firms have been guilty of doctored gimmicked financial statements ever since April 2009, when the USCongress blessed the decision by the Financial Accounting Standards Board. The FASB decided to permit the financial firms to declare any value they wish for rotten assets, the collection of impaired assets not to face the grim reaper of reality. The parade of Zombie Banks has reeked havoc ever since upon the economies. Criminal deeds have become the norm. The established norm has been for outsized naked short positions for the Big Four US Banks. They are an everyday fixture. No laws are enforced for selling enormous supply without metal. Why on November 15th, my colleague Turd Ferguson reported the following gold ambush. In the TFMetals Report, he summarized the ambush as he wrote, "Over the course of about 5 minutes, one single order was filled. This massive dump of about 25,000 gold contracts managed to move the price of gold down by nearly $20. To give you an appreciation of the size and scale of this deliberately criminal act, 25,000 contracts is the paper equivalent of 2.5 million ounces of gold, or roughly 77 metric tonnes, the paper equivalent to the alleged physical holdings of Australia or Indonesia." No end to the naked shorting. The financial press reported not a peep on order by the Syndicate, who act as advertisers on the network channels. On November 2nd, the Silver Doctor reported a similar silver ambush. NetDania provides a service, to estimate volume from five separate market sources. It is not an exact indicator of volume data, but does shed much accurate light on the deeply corrupted market. According to NetDania, a total volume of 38,400 contracts, equal to 191.99 million ounces of paper silver were dumped on the market in only ten minutes between 8:30am and 8:40am EST. The Boyz chose to execute the raid precisely on the day of the gimmicked Non-Farm Payroll data release. They smelled a potential for a precious metals price uprising, and snuffed it. The volume for those ten minutes corresponds to nearly one quarter of annual global silver production! Not the US output, but global output. No response by market regulators, business as usual. Criminal deeds have become the norm. Money laundering has kept the entire major US banks afloat, the money laced with narcotics. Overnight satisfaction of loans is sometimes done with heroin paper packets the size of bricks. For the last 20 years, the New York and London bankers have illicitly (nicer word than illegally) leased official gold accounts. Those nations are one by one demanding their gold repatriation. Hot war has been justified in order to win the release of official gold held in accounts. Plenty of Arab despots sit in power, but the Libyan seat was targeted as special for its 144 tons of gold. The London bankers pilfered the Libyan gold account in the Qaddafi name, offering flimsy requirements for its return to their people, demands which will never be met. The stolen private accounts at MFGlobal waiting for silver delivery served as another criminal deed. The crime scene was protected by the US regulators and the courts. Apparently, the wrong interpretation of bankruptcy law matters little. MFGlobal was a brokerage firm, not a financial firm. Therefore, the private accounts should have been held first in line for redemption, not last. The criminal appellate court upheld the wrong decision. The newest criminal streak involves tungsten lacing in fake gold bars. The story was cited here in early 2010, with Rob Kirby taking the lead. My source informs that two important characteristics are noteworthy. The Hong Kong banks are the biggest among the victims. The distribution routes run through a crucial Central American nation, just like the narcotics. Fort Knox was systematically gutted as its content bars were swapped, whose extent has yet to be determined. Expect some deep consequences for the counterfeit in Tungsten bars. Refer to TRIAD for old fashioned justice, and the Intl Court of the Hague for justice with more procedure involved. Perhaps the unusual story of bankers simply vanishing will be the case. The most prominent criminal practice has been challenged, the illicit usage for leasing of official gold accounts in the name of sovereign governments. The challenge will make for the grandest banker scandal in modern history. My source estimates that over 40 thousand metric tons have been vacated from the official accounts over the last two decades. Clearly, the volume indicates a lot of unofficial unaccounted gold, which nonetheless exists. The pressure has finally come to the London bankers largely responsible for the happy fingers. The New York and Swiss banks have been working overtime, often in midnight emergency shipments, to avoid a direct default. That would be both embarrassing and an invitation for prosecution which would be difficult to prevent, given the public outcry. As the London bankers struggle to meet the repatriation demands, the pressure will not relent. They must replace the leased gold or see their crime scene exposed. Only when the vast Swiss repository is denied to the London banksters, the drain will erupt into a major gold default event with glaring publicity. It is when they are exposed, when the urgent need to replace the improperly leased (stolen) gold is realized, when the public and financial community is made aware of the altered Supply & Demand dynamics, that the Gold Price will shoot upward fast hard and without stopping. Far less gold is held in supply than recognized, while tremendous gold demand occurs. The Allocated Gold Account scandal will force the Gold price to $5000 per ounce, at a minimum. The agreed upon trade settlement gold core will probably permit the gold price to be fixed on a temporary basis. Gold is in increasingly short supply, given the labor problems in both South Africa and South America. Expect important gaping shortages and deficits. So the $5000/oz price is only a target, easily surpassed. The law can be stated: Gold Bullion diverges into official voided supply, matched by huge syndicate supply. The visible vault storage with public accounting will eventually show nothing present, while the private syndicate vault storage will be hidden from view. One private important location is the Carlyle Group, which holds significant counter-party positions to the vast short positions that Wall Street banks are responsible for. The biggest hidden gold hoards, truly magnificent in size, are located in Basel Switzerland, the Roman Catacombs, under the Kremlin, and by the ancient Chinese families, along with Wilbur & Mack who buried a hoard in their Arkansas backyard ready with buddies Smith & Wesson. The divergence will continue until the official gold supply is demonstrated, with shock & awe, to be near zero. Another important divergence will occur. The official price discovery markets such as the COMEX and LBMA will be exposed as having near zero Gold & Silver in inventory. The prices posted for Gold & Silver will remain artificially low, held down by corrupt methods such as widespread naked shorting (permitted by the US regulators and USDept Justice). The physical price paid for Gold & Silver will continue to rise without bound. Already, no more large gold purchases can be satisfied, since supply is for the most part gone. Premiums for coins are on the fast rise, if coin supply exists at all. The unfortunate aspect of Supply & Demand dynamics is that when price is forced down by intervention and other illegal pressures, the result is vanished supply. That is precisely what is happening. Expect a tremendous divergence to occur, as the COMEX and LBMA tagteam of corruption experience a total depletion, but report some asinine moderate price. Nobody will be able to purchase at their posted price, since they will not have any Gold or Silver metal in inventory. It will be gone. Extraordinary methods are being used right here, right now, to prevent the default. See vast exports of gold from the US to London. See the vast shipments of silver from the US to London. See the rapid decline in the GLD & SLV inventory, which the Wall Street firms have access to. See the MFGlobal and PFG-Best private account thefts. Coins exhibit the inflation in a highly visible manner. The coins in the Untied States & Canada are going away for 1-cent and 5-cent pieces. A friend in Toronto reports that recent modifications to the looney and tooney (C$1 and C$2 coins) have not only altered their appearance, but have altered their perception. They seem like play money to the public, which has shown derision. The US merchants will soon be permitted to round the transaction costs to the nearest 10 cents. The visible inflation has resulted in the cost of making small denomination coins too expensive, and thus impractical. ZIRP & QE will do that. The cost to make a 1-cent US penny is now 4.8 cents and the cost to make a 5-cent US nickel is now 16.2 cents. How embarrassing, even adding to the USGovt deficit. Due to high zinc and other cheap contents, the 10-cent US dime and 25-cent US quarter are still inexpensive to make. Why not use wooden nickels? Unless subjected to another fabricated hurricane, they will hold a stable appearance, if not value. A quick review of the National Atmospheric Release Advisory Center website will demonstrate easily the evidence of South Atlantic heavy microwave activity during the entire month of September. Angels don't play this haarp. The law can be stated: With Gold goes the geopolitical power. As huge amounts of Gold are shipped Eastward, with huge tonnage leaving London for points East like China, so goes the important shift in geopolitical power. A Paradigm Shift is in progress, at work. Since March 2012, a whopping 6000 metric tons of gold bullion has been shipped from London to the East, primarily China. The circumstances behind the shipments are murky, but they indicate private off-market transactions that are intended to avoid publicity. My suspicion is that old wealthy Chinese families had their Allocated Gold Accounts improperly used in leasing practices by London bankers, associated with posted margin on a gaggle of leveraged contracts spanning from sovereign debt to currencies. The trades went sour. Margin calls were enforced with lost gold in a grand forfeit, the London bankers feet put to the fire reportedly. Publicity was avoided, but in the process a tremendous amount of gold was forfeited. With the gold went a transfer of power, to the East. They will dictate terms of the new trade settlement system. They will become the world's more prominent lenders. They will control the next geopolitical chapter. Since the Lehman bust in September 2008, the global financial crisis has been a fixture, without solution. My preference is to call it the Global Monetary War, whose unspoken main objective by the powers in control is to maintain power, to preserve the big banks as fortresses of power, and to protect the USTBond & USDollar in their primary perches. Two important events have altered the crisis. The first was the breakdown of the Southern European sovereign debt structure. The Greek Govt Bond went into crisis mode in late 2009, which spread to Ireland, Portugal, and lately to Spain, Italy, and France. It will consume the Euro currency, despite all their best efforts NOT to fix anything, despite their best efforts to alter the bond subordination in new bond issuance. The Europeans are guilty of kicking the debt can down the road, just like the Americans. The victims that topple the system will be the big national banks in the affected nations of Europe, even the German banks. Their flagship Deutsche Bank has been dead for years, full of hollowed corridors. The second important event was the widening demands for repatriation of official gold accounts. It might have begun with Chavez in Venezuela, but it has continued. The Ghana Govt made their gold account repatriation demand, but a mysterious death of their leader halted the process. The Germans are spearheading this revolt. The Dutch will follow. The Austrians are next. Even little Ecuador wants one third of their gold account returned. Others will join. An extreme wild card has surfaced. It began to be in play when Saudi Prince Bandar was assassinated a couple months ago, at the hands of HezBollah. Of course, the event was kept secret, but the Saudi Minister of Security was killed as revenge for the Saudi role in the high level Syrian assassinations. Phony photographs and other doctored official accounts have been produced by the Riyadh crowd to conceal the damage. The House of Saud, so the Jackass has claimed for two months, is in danger of falling, along with the Petro-Dollar. Well this week, reports have come out that King Abdullah faces death. He underwent a mid-November back surgery but has not recovered, or even come into consciousness. His entire set of organs has shut down, no longer functioning. The risk to the Petro-Dollar was high with the Bandar killing. The risk just went double acute with a succession to the throne imminent. Domestic challenges by an increasingly aware population, beset by higher cost of living, will come. The great Saudi oil surplus is slowly dwindling, what with higher domestic usage in a higher standard of living. The foreign challenge will remain from HezBollah, with roots from the radical and very powerful Shiite sect. Expect the Petro-Dollar defacto standard to fall in the coming months, as only weak successors remain in the line of surviving brothers. Think bottom of the family barrel (of oil). The teetering USTBond and confronted USDollar make for a poor foundation on which to keep the Petro-Dollar in place. Imagine the impact if the Saudis announce that Euros, Pounds, Swiss Francs, and Yen, even Gold are accepted for crude oil transactions. The Petro-Dollar is walking dead. The process began with a Gold Price breakout in Euro terms. The continent is the site of the most visible systemic bust that has engulfed the sovereign bonds, the big banks, and the economies, even public trust. Soon to follow suit will be the Gold Price breakout in US$ terms, in British Pound terms, and in Japanese Yen terms, an event to occur simultaneously. The central banks from Europe, the US, the UK, and Japan are coordinated and aligned. They are all putting into practice the monetary lethal policies of unlimited hyper monetary inflation with a 0% rate attached. Witness Weimar gone global in a grand currency debasement. The Gold price will surpass the US$2000 mark easily. 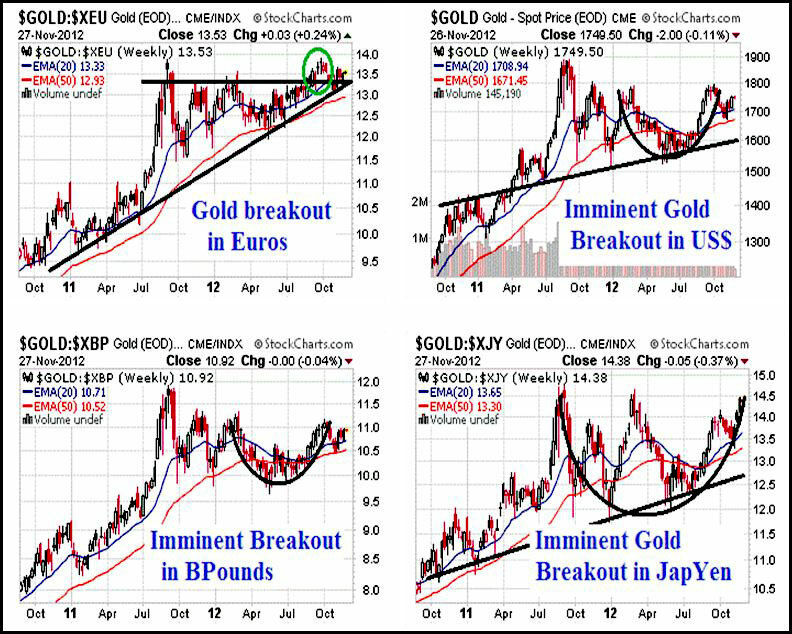 When it does, the Gold Price breakout will be recognized in all major currencies. The central bank franchise system is broken. The global monetary system is broken. The big Western banks are broken. The financial markets are broken. The safe savings vehicles are broken. The all-important confidence factor to support fiat paper currencies is fast vanishing. The arrival of the Gold Standard as the solution is being slowly manifested in the form of a gold-core trade settlement system, which will drive a global Gold Standard. The new system will dictate bank reserves practices, and render the USTBond as a rejected toxic paper relic. It should arrive early in 2013. In the process, the Western nations will become impoverished, as they desperately cling to the failed system. Anger will rise. Disorder will prevail. The USDollars inside the United States will be trapped, then devalued as the public watches in shock. The power will shift East inevitably, with the shipment of Gold. A new era will begin.